Fifty years ago this year, David H. Frisch and James H. Smith published an ingenious confirmation of special relativity (see D. H. Frisch and J. H. Smith, “Measurement of the Relativistic Time Dilation Using µ-Mesons,” American Journal of Physics, 31 (5): 342–355, 1963). Image from an underground muon detector pointed at the moon. Since the moon filters out a small fraction of cosmic rays, it leaves a visible shadow. Frisch and Smith studied muons, which are unstable electron-like particles. Muons have a mass roughly 200 times that of the electron, but decay moderately rapidly, with a half-life of 2.2 microseconds. Muons are formed in the upper atmosphere, when high-energy cosmic rays collide with atomic nuclei in the air. This raises the question: why don’t they all decay before they reach the ground? Even travelling at 99.5% of the speed of light, the time taken to reach the ground is many half-lives. 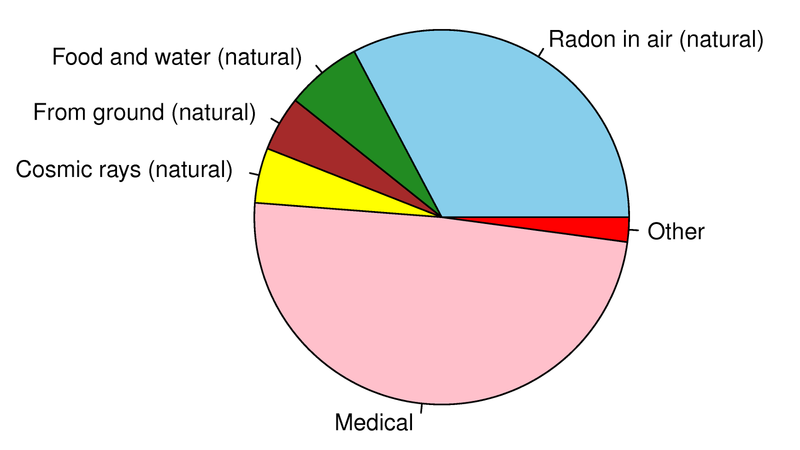 Sources of radiation exposure for a typical person in the United States. Cosmic ray exposure includes muons. Frisch and Smith counted muons at an altitude of 1910 metres on Mt. Washington, New Hampshire, as well as at (close to) sea level. An average of 563 muons per hour arrived at the top of the mountain, and an average of 408 at sea level. The muons took 6.4 microseconds to travel the extra distance, but very few decayed during that time. Frisch and Smith calculated that this reflected a time dilation factor of 8.8±0.8. In other words, from the muons’ point of view, the 1910-metre journey took about one-ninth the time: less than a microsecond. This agreed very nicely with the relativistic prediction of time dilation by 8.4±2 times, thanks to some very elegant experimental technique (the large theoretical uncertainty reflects the variation in muon speeds). Well done, guys! Everyone interested in science should probably have this one on the coffee table. Owners of the book can find some online resources here. A recent study of the wing-propelled diving bird Uria lomvia shows that it has the highest recorded flight cost among vertebrates. That is, this bird (which consumes 146 watts/kg while flying) is so well-adapted to using its wings for diving that its flying suffers. In other words, the Thick-billed Murre is half-way to becoming a penguin. The Saturnian moon Hyperion, seen above in an image from Cassini, is known for its chaotic, tumbling rotation. The video below gives a sense of what this cosmic potato looks like, using the Celestia software (running at 100,000 times real time). Thanks to YouTube user “Beth F” for the video. Lorenz’s classic paper described the Lorenz Attractor. The image above (by “XaosBits”) shows two orbits of the attractor. Microscopically different starting points give totally different trajectories. The image below (by “Wikimol”) gives another view of the attractor. Lorenz’s paper was followed by the discovery of the Rössler attractor in 1976, and then what can only be called an avalanche of further work. Prior to Lorenz, signs of chaos had been seen in the logistic map, but Lorenz showed that the world itself (weather, specifically) was chaotic. Chaos also shows up in orbital motion, in turbulence, and in mixing. The image below (by “Eclipse.sx”) shows the result of simulating a magnetic pendulum. Lorenz went on to coin the term “butterfly effect.” This effect, more formally known as “sensitivity to initial conditions,” is one of the key marks of chaos. Another is “topological mixing,” which means that the system will evolve over time so that any given region of its phase space will eventually overlap with any other given region. The image below (public domain) shows a circular region (blue) progressively being mapped (purple, pink, red, orange, yellow, and further iterations not shown) to a set of points which leaves no blank areas in the phase space. Lorenz died on 16 April, 2008, at the age of 90. Physics Today also published an obituary when Lorenz died. The truths of mathematics appear to be different in nature from the truths of physics. Formalism accepts this, but suggests that the nature of mathematics is inherently cultural. Different branches of mathematics are essentially just games with symbols and arbitrary rules – games that don’t have any particular meaning. Mathematicians simply work within the chosen rules. However, apart from the problem of the “unreasonable effectiveness of mathematics,” the idea that these rules are chosen arbitrarily runs counter to the experience of most mathematicians. When the concept of “number” was extended to include the imaginary numbers, for example, consistency with the existing rules meant that there was very little choice about how imaginary numbers behaved. In the words of mathematician Jacques Hadamard: “We speak of invention: it would be more correct to speak of discovery… Although the truth is not yet known to us, it pre-exists and inescapably imposes on us the path we must follow under penalty of going astray” (from the introduction to The Psychology of Invention in the Mathematical Field). Many officially formalist mathematicians are Platonists at heart. Jean Dieudonné once wrote with refreshing honesty: “On foundations we believe in the reality of mathematics, but of course when philosophers attack us with their paradoxes we rush to hide behind formalism and say: ‘Mathematics is just a combination of meaningless symbols,’ and then we bring out Chapters 1 and 2 on set theory. Finally we are left in peace to go back to our mathematics and do it as we have always done, with the feeling each mathematician has that he is working on something real. This sensation is probably an illusion, but is very convenient.” (from “The Work of Nicholas Bourbaki,” American Mathematical Monthly, 77(2), Feb 1970, p. 134–145). Most mathematicians feel that the truths of mathematics are indeed in a different category from the truths of physics – that the truths of mathematics in a sense come first. Logicism is a way of rescuing this aspect of Platonism while avoiding the more mystical aspects. The basis for logicism is that logic also comes before physics – all sciences assume logical thought as a starting point. Logical truths “exist” in some sense, and logicists assume that there are no philosophical difficulties about this kind of existence. In other words, a mystical Platonic world is not needed to explain logic. Consequently, if we can provide a foundation for mathematics in terms of pure logic, we can retain all the benefits of Platonism without any of the problems. In logicism, numbers are defined as being particular kinds of sets. Logicism began with Gottlob Frege, who published two volumes of his Die Grundgesetze der Arithmetik in 1893 and 1903. Sadly for Frege, his fellow mathematician and philosopher Bertrand Russell found a major flaw – now known as “Russell’s paradox” – in the work, just before the second volume was published. With Alfred North Whitehead, Russell was able to repair the flaw, in a three-volume work called Principia Mathematica (published in 1910, 1912, and 1913). After 379 pages, Whitehead and Russell are well on the way to proving that 1 + 1 = 2. The logicist programme, however, is not free of problems. First, it is extremely complex. It took Whitehead and Russell hundreds of pages of complicated logic to prove that 1 + 1 = 2. Normally, we try to explain complex things in terms of simple ones. It seems a little perverse to give such a complicated explanation of numerical facts that we understood in kindergarten. And, by including set theory as part of the basis, it isn’t really “pure logic” any more. Second, there is more than one way of defining numbers as sets, and none of them is obviously “right.” This has led to the suggestion that sets are “what numbers could not be” (the title of an article by Paul Benacerraf in The Philosophical Review, 74, Jan 1965, pp. 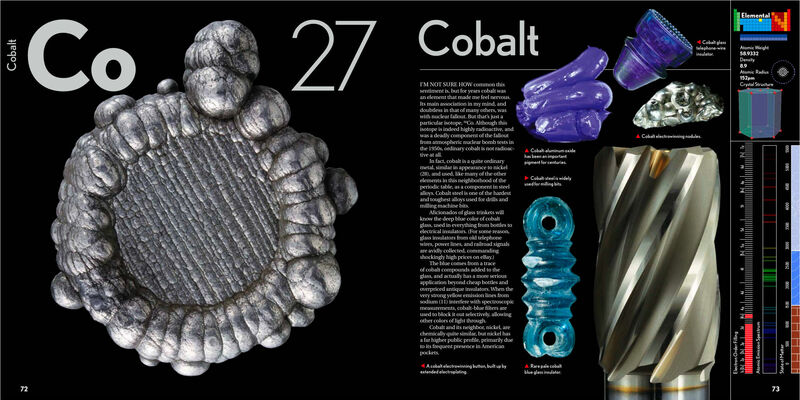 47–73), and that numbers must be fundamentally different in nature from sets – if not Platonic objects satisfying certain axioms, then something else which exists in a non-contingent way. Third, it is unclear whether logicism has actually gained anything. The starting assumption was that logic was simple and obvious, raising no philosophical problems. But if all of mathematics is hidden deep inside the structure of logic, then perhaps logic is not as simple as it first seemed. Mathematics and logic may in fact be different aspects of the same thing, but this may not make the fundamental questions about mathematical existence go away. Personally, I still see Platonism as the best answer. How about you?